Part 1. 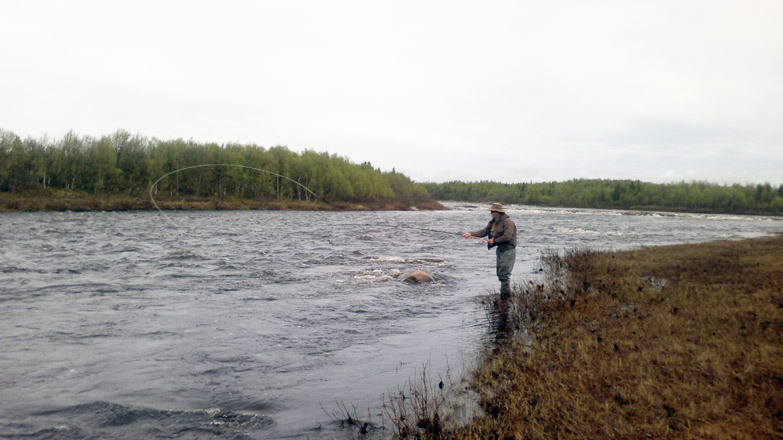 Status of the river and the conditions for fishing, established at the beginning of the season. The success of fishing salmon depends on the condition of the river and from our technical capacity to adapt to it. Heavy snowfall in early May led to a persistent increase of water level in the river. But unlike last season, the maximum water level is now not exceed critical levels. But the heavy rains and floods in early June have contributed to the preservation led to a very slow decline in the water level.The water level in the first weeks of June has exceeded the normal level for this period of time on 60 cm and by the end of the month by 20 cm.. Probably the excess of rain causes premature rise in temperature of the water in the river, which reached 12 degrees at the beginning of June (under normal 6-8), and then 13 degrees in the middle of the month. Unusual for this period air temperature dropped down to 8-15 degrees which may had its effect of salmon activity. Thus we had a situation when the temperature of the water exceeded the temperature of the air which was very unusual. Typically, this situation is regarded as unfavorable to the activity of the fish. The next paradox is that the end of June, along with a very slow normalization of the water level, rise in air temperature, we could observed a decrease in water temperature in the river. By the last week of June the temperature dropped to 11 degrees. At that time there was a sharp increase in the activity of all fish species in the river. I think that all of this can be explained by the presence of excessive amounts in the river of "foreign" water. 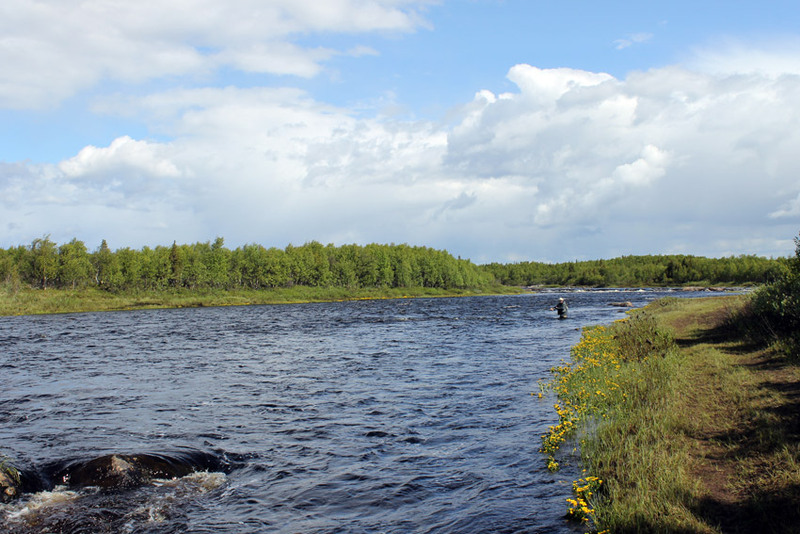 Meltwater of the recent heavy snowfall and relatively warm water after heavy rains in June caused activity of salmon and other resident fish in the river, such as grayling and trout. The same can be explained by a very sluggish entry of the salmon into the river from the sea in late May and early June. The same can be said about the activity of the autumn fish that remained in the river during the winter and spring. 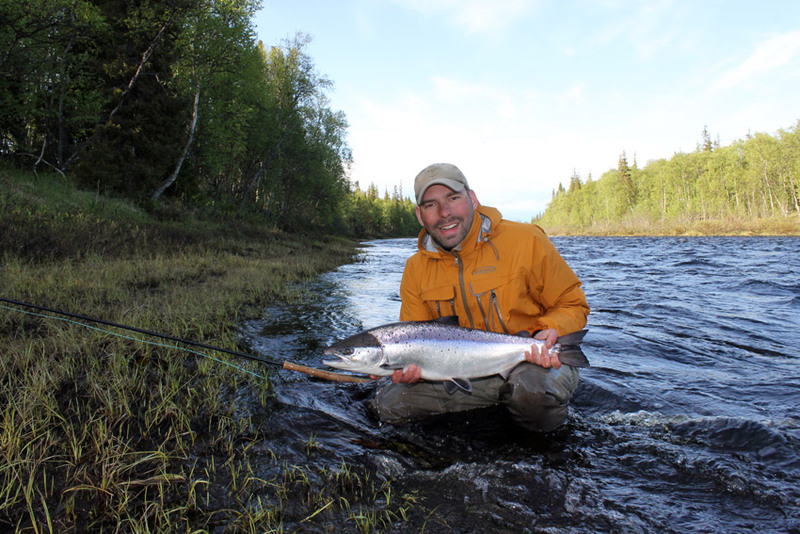 Unlike the last season of 2014, when the water temperature remains comfortably low for most of June this year, early and persistent increase in water temperature has led to reduced activity of salmon. This is especially concerning the large fish, the activity of which often depends on the comfort temperature of the water in the river. Excessive amounts of "foreign" water can explain the early departure of sea trout from the river to the sea. 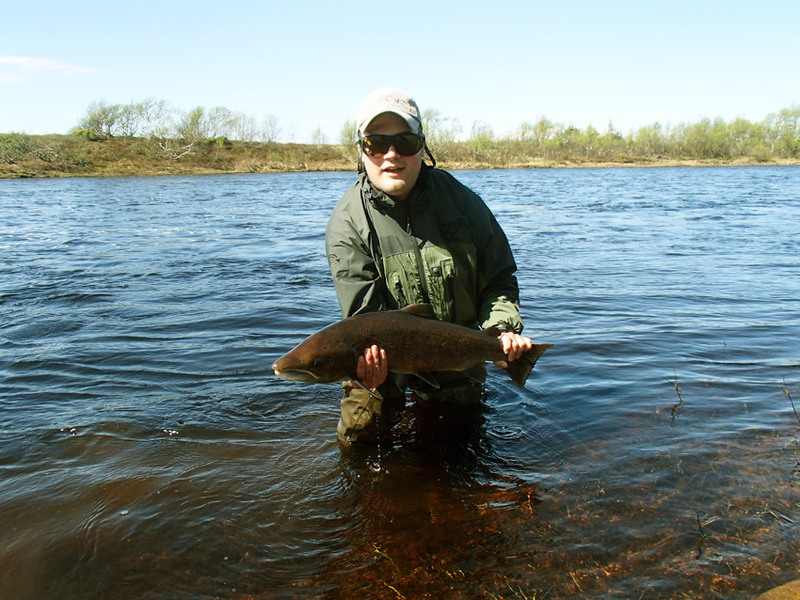 Typically, the sea trout in the river stays until the second week of June until the temperature in the river does not exceed 8-9 degrees, then you can watch the mass exodus of trout in the sea. 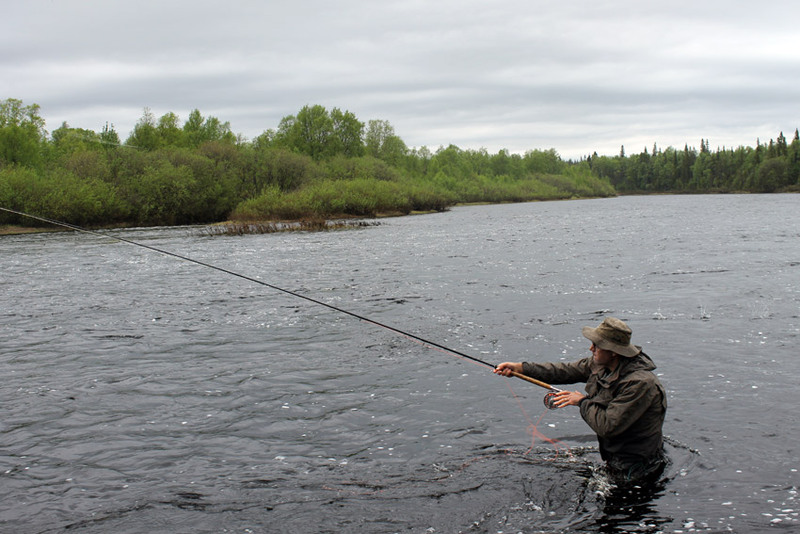 This year, by the end of May, most of the sea trout were gone to the sea. Thus, there are several factors that determined the conditions of salmon fishing on the river Chavanga early in the season. 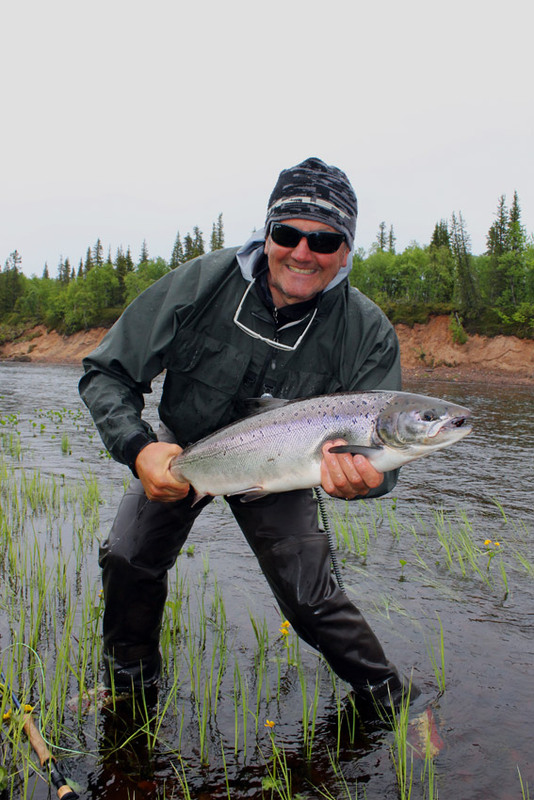 The influence of these factors on the strategies and tactics for salmon fishing I'll discuss in the next part of this article. 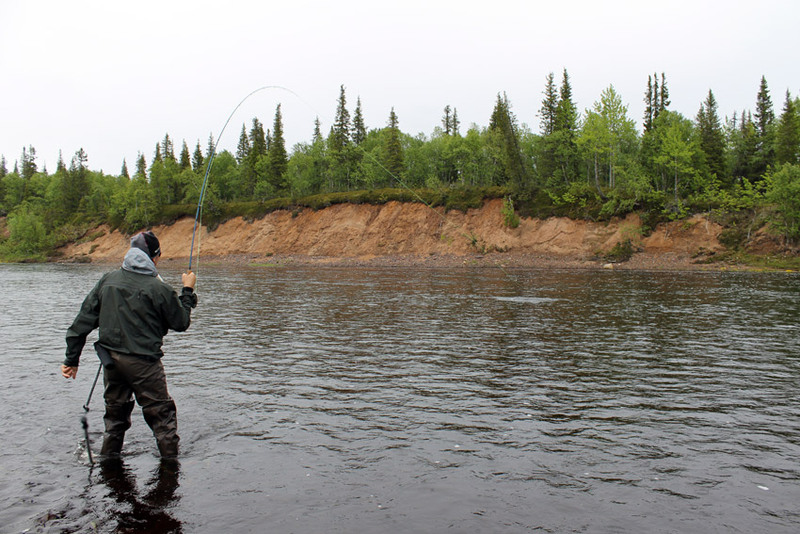 High water level has reduced the amount of good and comfortable places for salmon fishing. 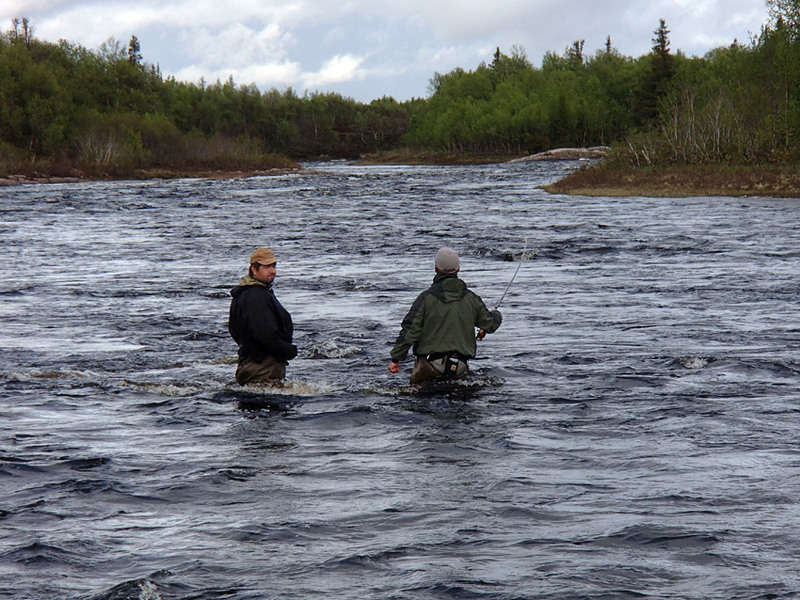 Unfortunately, we were practically unable to fish lower and upper parts of the river. The problems were related to two main reasons. 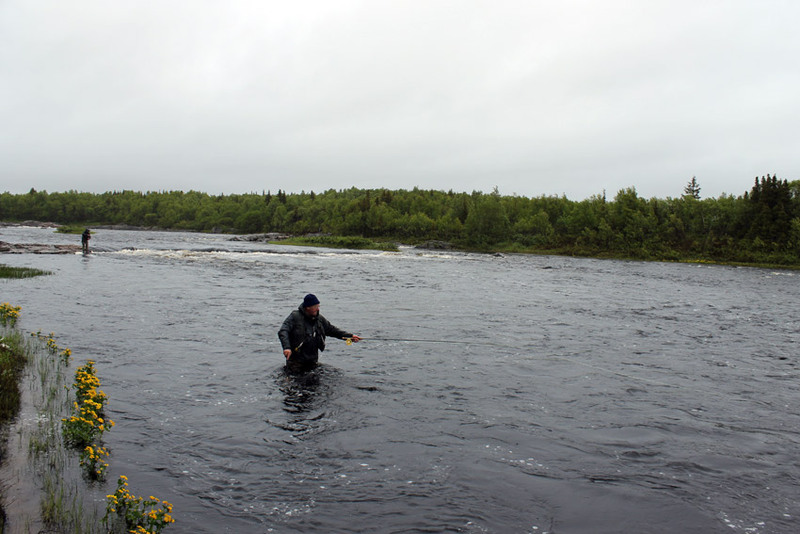 First - it was difficult to get into the river and take a favorable position for fishing on the famous salmon pools. 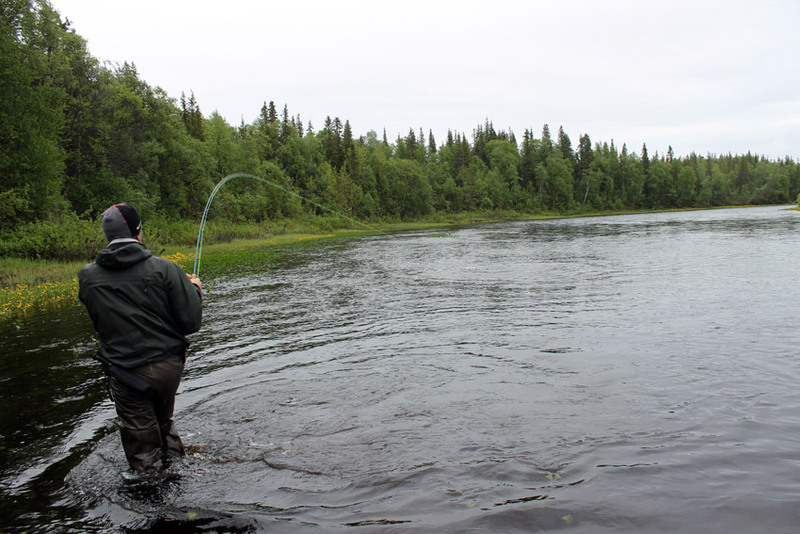 Particular difficulties were experienced by anglers without technical and physical abilities to fish in such a conditions. Often I had to fish from the bank or standing in the narrow coastal zone. In the absence of a good fisherman casting skills, effective fly presentation zone was simply limited and chances for a salmon bite were minimal. Particularly difficult from this point of view was the first days of June. By the middle of the month the situation has improved, but still moving along the bottom of the river was very tough for fishermen and demanded big effort. Second - the high level of water has led to many promising pits, tunnels and rocks in the river were closed by the powerful streams of water. We had to leave a familiar place for the time and focus on the search for affordable coastal wells and creeks. Unfortunately, in those places it was hard to guarantee a constant presence of the fish. In such circumstances, a huge role played the physical ability to go into the water and take a comfortable position to cast. Once again, I advise you to use shoes with felt sole not the plastic one. 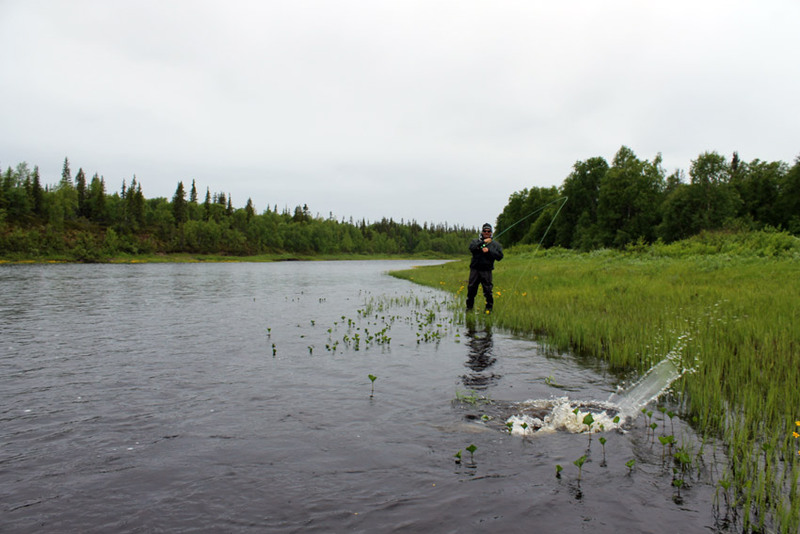 Position located of one - two meters away from the bank, means that you have a 3-4 meters wider are for fishing. Position on the bank causes fisherman to cast more across the river. Such an attempt to increase the distance of fishing often leads to a dramatic reduction in the quality and efficiency of the fly working in the water. Also Increasing the time of inefficient drift of your fly. 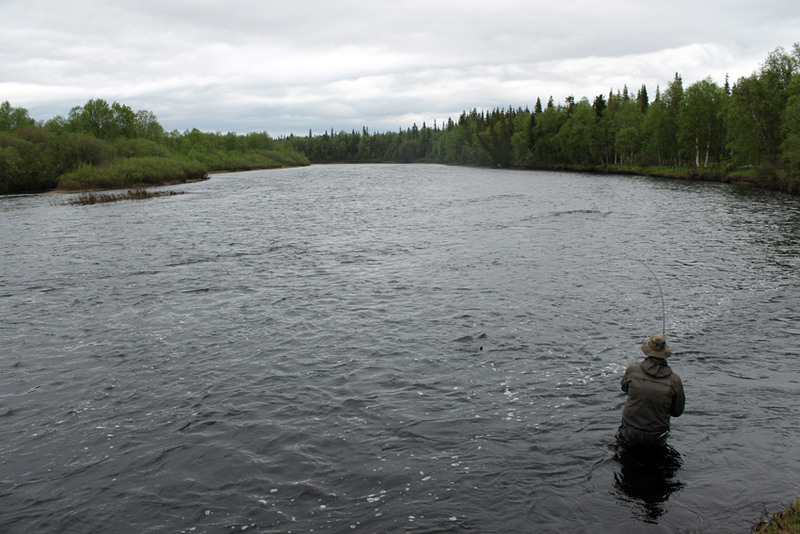 Therefore, the right sections of the river would be a combinations of where the salmon stay and where it is comfortable to get into the water, its came out as a critical factors for successful fishing. It is necessary to add that because of the quality of the water and its temperature characteristics, salmon preferred to stay in the deepest places with a relatively fast current. That is - the most remote parts of the river. The main question for every fisherman - is there fish or not? But there are usually a lot more of questions to deal with. How fast particular pools were required to fish, how many times to fish it from the beginning to the end? Is there enough time to catch a fish? To change a fly or not, if yes how often? Change a tackle before a new try and how often? In each case an individual decision is taken. 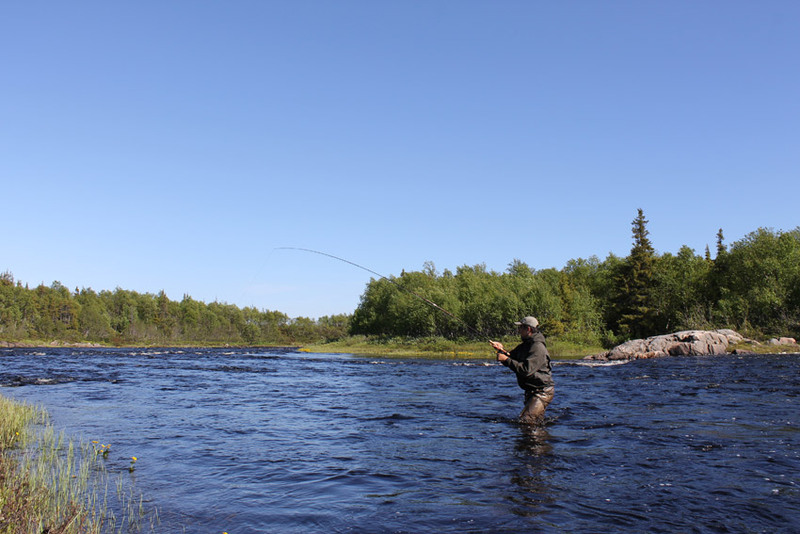 Often, the decision depends on the physical capabilities of the angler and his ability to achieve efficient work of the fly in the water. It was possible to define parts of the river where the fish came across on a regular basis, regardless of our attention to them. There were areas where the fish are occasionally met, but to spend much time on them had no sense. In general, we tried to fish as many available places as possible and stayed for a long time only in the most effective ones. We had to make daily adjustments to the fishing plans, having taken into the account the conditions of the river and also trying to optimize our physical abilities and transport capabilities. Finally, a few words about the flies and their presentations. The most effective were the weighted flies and relevant sinking lines and leaders. they had affect on casting but allowed to present the fly comfortably in front of passive fish. Often when fishing a passive fish, the most effective way is to keep the fly in the water with minimum side drift as possible. Correct fly presentation can most of the time be achived only through correct positioning in the water. Colours of the fly did not play a significant role. We used different options, and the result in most cases depended on the positioning in the water and right presentation of the fly. Within a month, the water level slowly decreased. 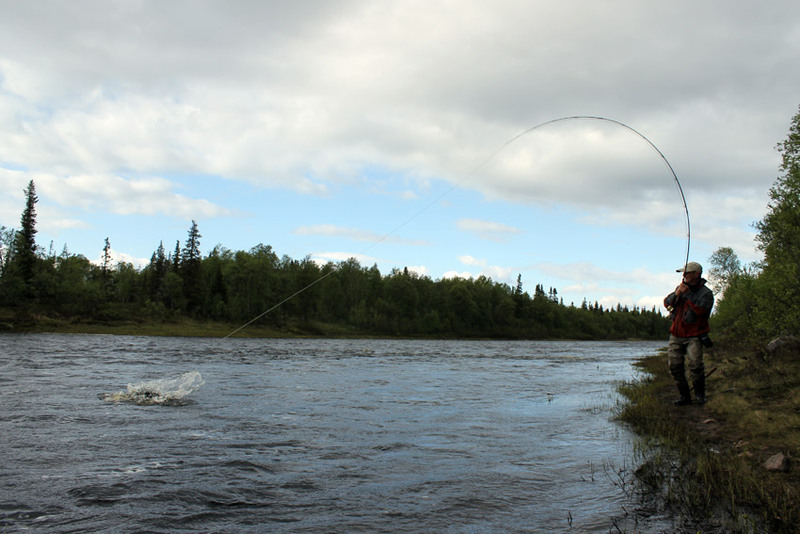 On the wide parts of the river, such as Cable pool and Skarpa near Pokosy Camp could comfortably be fished with a drop of just 5-10 cm of the high level. Later it became available to fish other pools out of canyons and cliffs, such as Oter stream, Line hole, First Cascade ... 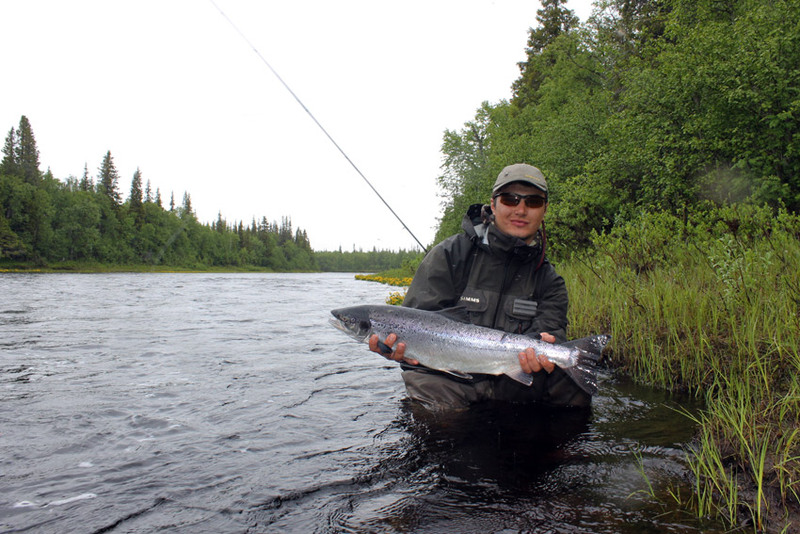 Unfortunately, many successful places left out of our ability to fish until the end of June. Almost completely dropped out of the fishing program the entire top parts of the river stretches from Little Chavanga and rapids in the canyons. 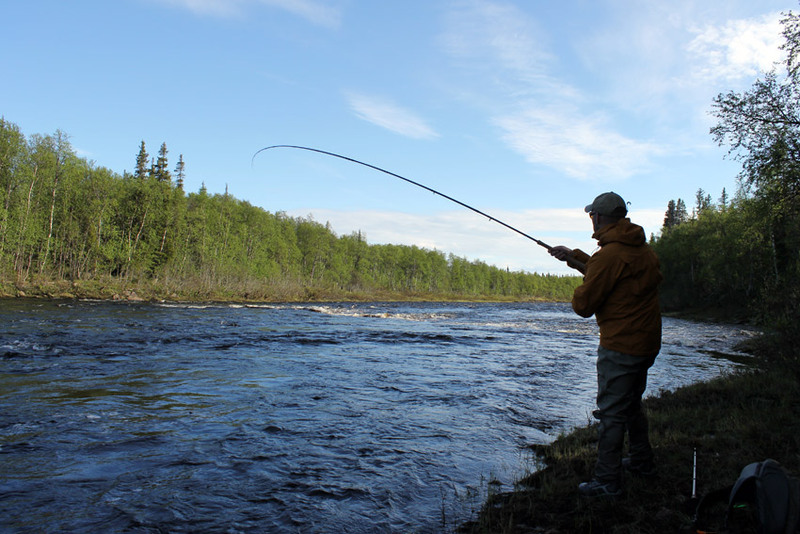 By the end of the month the water level returned to normal, the river has become almost universally available for fishing. Some decrease of the water temperature also resulted in the rise of salmon activity. This could be judged by significantly increased number of bites and the surface activity of the fish. 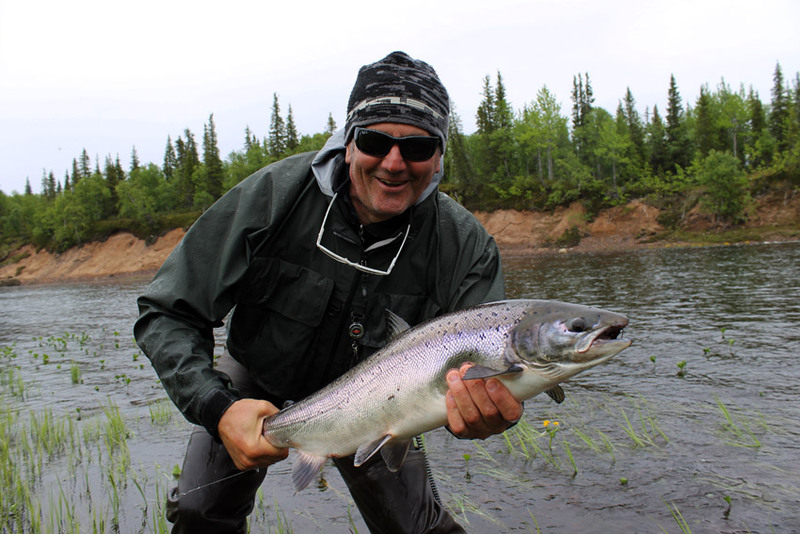 It was time to get back to normal and more regular methods of salmon fishing. 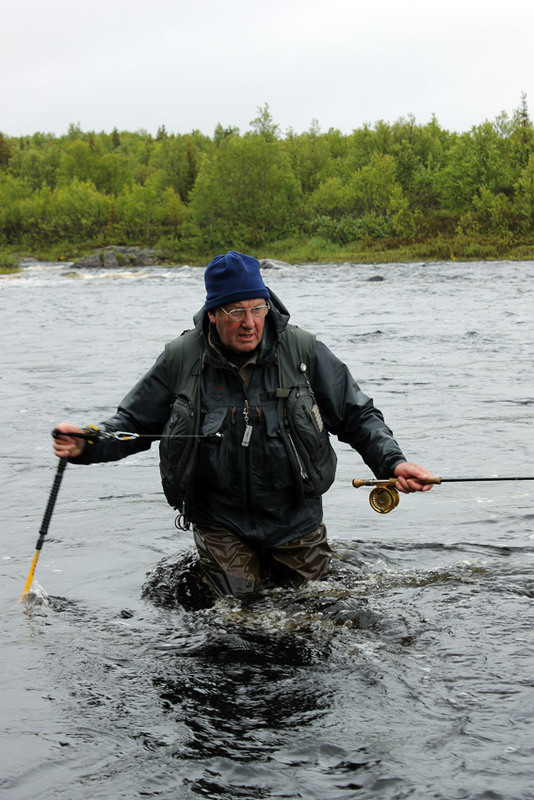 But perhaps the first time in many years the water level remained too high to fish the river with single hand rod. 6. Two-handed rod 9-10 class would be a good choice for a weighed flies, such as needed for a high water levels.